A carburetor is a device that blends air and fuel in the proper ratio for the combustion in an internal combustion engine. In automobile engineering, it is most important to supply proper air-fuel ratio in inlet manifold of the internal combustion engine. A good Carburetor will do this for your engine. Internal combustion engine has very low comparison ratio. It also uses highly volatile liquid fuel such as petrol, paraffin etc. Hence the carburetion process is must requirement. The process of breaking up the fuel into minute particles and mixing it with air is known as carburetion. In the carburetor, the fuel is completely broken into the minute particles, vaporized and mixed with the air in a proper ratio. The homogeneous mixture of fuel and air thus obtained is supplied to the engine cylinder. This device is used in petrol engine or similar liquid fuel engines. By means of which the fuel mixed with air is supplied into the induction manifold of the engine. Simple carburetor consists of a venturi and a fuel jet located therein. 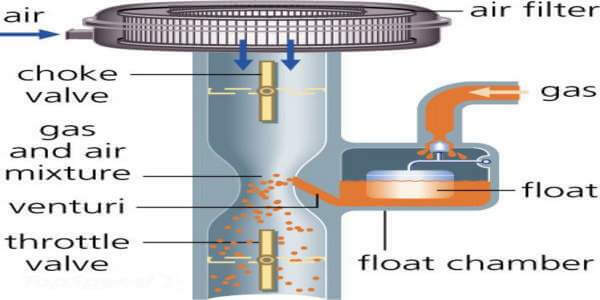 For maintaining the level of fuel in the jet, a float chamber is usually required. A rotary type valve also can be used instead of disc type. The level of fuel is just kept slightly below the top of the jet to prevent the leakage when not in operation. Normally 1.5 mm difference is kept between the top of the jet and the surface of the fuel in the float chamber. A needle valve controls the passage of fuel from the fuel pump when the air begins to flow past the jet; a low-pressure zone is created in the venture because of the increased velocity of air. The fuel begins to rise because of the difference in the air pressure on the fuel which is equal to the pressure of the atmosphere and on the fuel in the jet at the venturi and issue out from the jet in the form of a fine spray. Minute petrol particles present a large surface area being exposed to the air stream. The fuel is not completely vaporized in a carburetor and some globules of fuel still enter the induction manifold. Those are vaporized during the compression stroke in an engine cylinder. A check valve controls the flow of air into the carburetor. 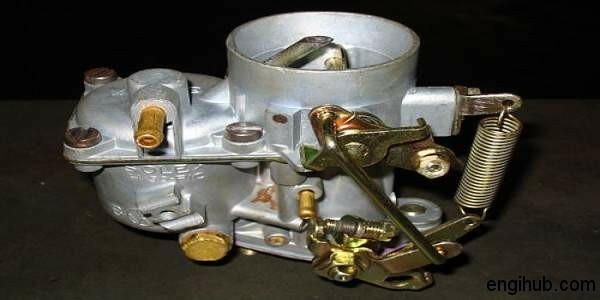 The gas-tight connection is provided between the carburetor and the induction manifold. When two concentric venturi is provided, the discharge end of the inner venturi called “Primary Venturi”. This lies just at the throat of the main venturi. A higher velocity of air which aids in the atomization of the fuel is obtained at the throat of primary venturi. As there is a lower pressure compared to the main venturi. The main advantages of multiple venturi are, these keep the fuel away from the carburetor walls. Hence obtain the considerable reduction in fuel consumption. 01) Updraft Type: In this, the air enters the carburetor at the bottom and leaves at the top. 02) Downdraft Type: In this, air enters the carburetor at the top and leaves at the bottom. This is used in most of the passenger cars. Because it can be installed at a higher level in the engine. Hence makes it more accessible for the purpose of inspection and repair. 03) Side draft Type: It has more width and mounting of oil bath air filter is clumsy.